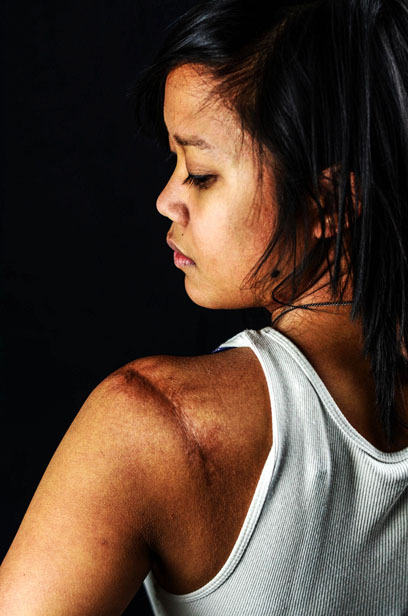 Christie Kiers couldn’t imagine anything bad happening to her the day of her accident. Christie was checking out a condo she was planning to put in an offer on. She was also looking forward to a relaxing steak dinner at home with her boyfriend. Because of her excitement about the condo, Christie was very distracted. After waiting a while for the steaks to cook on their outdoor barbecue, she went to check on them and saw the barbecue wasn’t lit anymore and was cold. Since Christie was hungry, and didn’t want to go to the store to buy more lighter fluid, she used two tablespoons of gasoline instead. Suddenly there was a huge ball of fire that came up Christie’s arm and caught on her long hair. After hearing the sound of her burning hair, Christie’s first instinct was to try to put the fire out with her hands. But that only made things worse because she was pushing the burning hair into her neck – her worst burns. As Christie ran inside her home screaming, her neighbours heard her and called 911 for help. When she got inside, there was a sink that was directly inside the kitchen door with a mirror over it and Christie saw herself on fire. As she tried to extinguish herself with water, Christie could see the skin on her hands peel off the same way you would peel off a rubber glove. Even though she couldn’t feel any pain, that’s when Christie knew things were bad. When her boyfriend saw her on fire he tackled her to put it out and then got her in the shower to cool her down. His shocked expression was another confirmation to Christie how bad her situation was. Even with the chaos, Christie was able to give her boyfriend orders on what to do to get ready to go to the hospital. When the fire fighters arrived about 5-10 minutes after the incident, they poured saline – a liquid solution used to treat burns – on her to reduce the pain. She also made it clear that she was ready to go to the hospital by sitting down on the stretcher immediately when the paramedics came. After arriving at the local hospital she was transported to the Vancouver General Hospital that night to their Intensive Care Unit. When she woke up the next day she thought it was all a bad dream, but realized everything was real. One of Christie’s good friends came to visit her and immediately fainted not only because of the sight of her, but because she smelled like gas, burned hair and burned flesh. Despite the initial shock, Christie’s hospital experience was positive and she felt a mutual love between her and her nurses. She also felt a lot of support, which included one friend who blogged about Christie’s burn injury and recovery and showed Christie the positive comments people wrote. Christie jokes that aside from the burns, her hospital stay was the best experience of her life. However, when her surgeon saw her walking, he decided she was ready to be released, even though she had only been in the hospital for two weeks. And that’s when reality hit. Christie bought the condo while she was in the hospital, but had to wait to move in for a couple weeks. She had to return to her home where she had her accident and she saw the barbecue everyday. Because it was summer the heat made her burns unbearable, which meant she couldn’t go outside. She also didn’t have the same support system as she did in the hospital and she felt alone and trapped. For six months Christie was on antidepressants because she couldn’t sleep. She also felt unhealthy because she wasn’t as physically active as she was before her accident. At this point she wished she had died. Two things saved her life: going back to work only six weeks after her accident and her dad being diagnosed with cancer. When her dad became sick Christie realized the focus wasn’t about her anymore and concentrated her energy on him. After her burn injury Christie decided on a career change and left her job of over 10 years as an employment counselor. She also sold a rental property she owned in Vancouver Island to buy her own business and became an entrepreneur. Christie also realized that she wasn’t in a happy relationship and parted ways from her boyfriend and began living a lower-stress life. Christie’s happy to share her story to help prevent anyone from making the same mistake she did. And while she never really concentrated on her appearance, Christie realized even more that looks fade after having to cut off all her burned hair and going through her recovery process. She also became more grateful for everything in life. Christie’s scars before and after make-up. Prior to her burn injury she only took two-minutes to put on make-up. Afterwards, it took her about 45-minutes to apply make-up, and now she’s minimized it to less than 10-minutes. In October 2012 Christie sold her business and moved to Fort Saint John, BC to care for father. She is now living there and has a job in management. Thank you for sharing your story! You are truly a beautful woman!